Our Earth consists of many hidden treasures in its fold, which we need to explore. 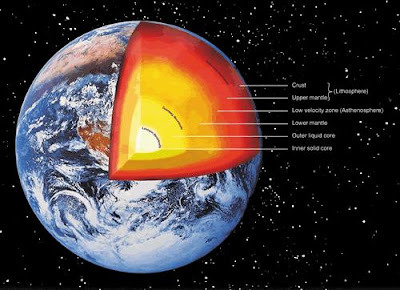 Much of the current information about earth's interior comes from studies relating to the paths of earthquake waves travelling through the Earth, and from laboratory experiments on surface minerals and rocks at high pressure and temperature. Other important information comes from geological observations and the flow of heat from inside the earth. Crust- The Earth's outermost surface is called the crust. The crust is typically about 25 miles thick beneath continents, and about 6.5 miles thick beneath oceans. The crust is relatively light and brittle. The thickness and composition of the earth's crust vary in the land and the ocean. Most earthquakes occur within the crust. The crust in this image is much smaller in the real earth! The mantle extends to a depth of 2890 km, making it the thickest layer of the Earth. The pressure, at the bottom of the mantle, is 140 GPa. The mantle is composed of silicate rocks that are rich in iron and magnesium relative to the overlying crust. Although solid, the high temperatures within the mantle cause the silicate material to be sufficiently ductile. Going from mantle to core, there is a marked decrease (about 30 percent) in earthquake wave velocity and a marked increase (about 30 percent) in density. The core is the innermost layer of the earth. It is composed of the outer core and the inner core. The outer core is presumed to be liquid because it does not transmit shear (S) waves and because the velocity of compressional (P) waves that pass through it is sharply reduced. The inner core is considered to be solid because of the behavior of P and S waves passing through it. Well, above is the description of the main layers comprising our Mother Earth. It is important to have knowledge about them for understanding the earth in a better manner.